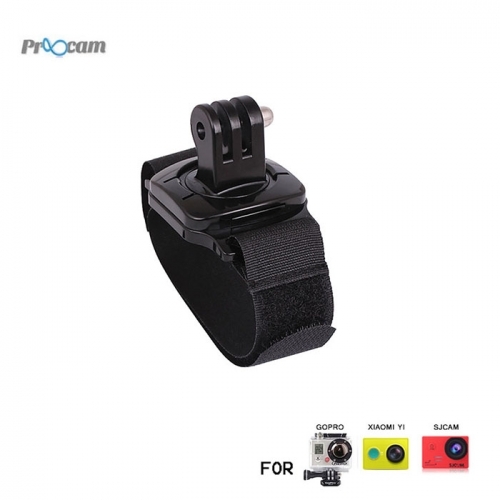 Proocam Pro-F045 Wrist Strap the Adaptor 360-degree , This for wear your GoPro like a watch for easy access when capturing footage on the fly. The Wrist Housing secures the camera flat against your wrist, yet lets you quickly pivot it upright to shoot photos or video. When not recording, you’ll have full use of both hands, making it perfect for surfing, snorkeling, climbing and skiing. Fits over ski gloves or jackets with the included adapter, plus straps to kayak paddles, kitesurfing kites and other gear for a wide range of shooting possibilities. Good for Hero 1,2,3,3 +, 4, can be installed after the 360-degree adjustable directional buttons fixed.